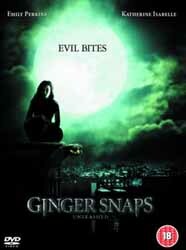 For anyone who hasn't already seen the very enjoyable first film, Ginger Snaps, this sequel may come across as a mite confusing, especially during the early scenes. It wrongly assumes that everyone wanting to see this will be a fan, but that's often a mistake; sequels should strive for new audiences as well as established ones. Aside from that complaint this is well worth watching, because it concentrates on Brigitte rather than werewolves. As I stated in my review of The Howling, directors should forget about showcasing the effects and concentrate on telling a good story. This is precisely what happens here; the main character and her anxieties drag you into her situation. Someone who is considered a worthless drug addict is in actual fact trying to save her own life and that of others by delaying her transformation. Emily Perkins achieves a very believable moody determination, and without it I'm certain this movie wouldn't be half as good. The werewolf effects are acceptable, but by no means outstanding, which is why they are intelligently kept to occasional glimpses for most of the running time. In early scenes when she's alone, Brigitte is visited in visions by her dead sister Ginger. I can understand that this is the obvious way of creating dialogue and progressing the story when there is only one person present, but this was done first and best in An American Werewolf In London, and I would have preferred it to not happen here. The extras are nothing special here, I'm afraid. A trailer, deleted scenes which are short and dull, actor auditions which are like watching paint dry, and storyboards/film comparisons (probably the only worthwhile special feature). I expected The Beast is Built to be a documentary, but it's only a few quick images of the werewolf sculpture and actor/werewolf visual effects. The whole thing lasts barely a minute which, when accompanying a fairly good film, must be embarrassing for all parties concerned. In all, a simple but effective film, but not quite to the same standard as its predecessor, and without much of the dark humour of Ginger Snaps. But you shouldn't let that put you off. Wait until next full moon... and then snap it up!